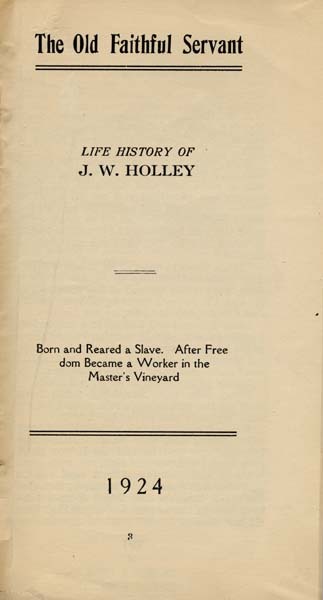 J. W. Holley, evangelistic preacher, born March 2, 1848, in Sullivant county, east Tennessee. He was seventy years old March 2, 1919. Born with a gift to preach the Gospel without a letter God uses me with power. I was a slave and God delivered me from slavery and sanctified and set me apart to preach the Gospel and said, "Go into all the world and preach the Gospel to every creature. He that believeth and is baptized shall be saved, but he that believeth not shall be damned." "Teach them to observe all things whatsoever I commanded thee to do, for lo, I am with thee even to the end of the world. You go and I'll go with you; open your mouth and I will speak for you." I was nearly drowned once in a river. I went down and came up the third time. I liked to got killed twice with a train. Every time that something would come upon me the realization would come upon me what my work was in the Lord. When I would go to any preacher of my color, saving one, they would criticize and laugh at me, and he told me if you don't preach God will kill you dead. I told him that I could not read and he said that was none of my business; that God knew His business and that I did not need to dictate to the Lord. And since that time He has done it. I was healed of three diseases without the aid of a physician or man's touch. After I surrendered to the Lord he said if you pray I will heal you. I said, "Lord, if you will heal me I'll obey and do whatsoever you command me in your name." I was nothing but a shadow and looked like a skeleton and he wonderfully healed me. Since that time I have walked thirty and forty and forty-eight miles a day and preaching as I traveled. I have been in one hundred and sixty-two towns and cities and walked in all, preaching as I go, freely give, freely received. I came through Kentucky, preached in eight large white churches and three court houses, and they published it in the paper, and I prayed for seven hundred white people to be healed in Anison county and Washington county, Kentucky. Jesus said, "Great work have you done. Greater work ye shall do. Many signs shall follow them that believe." I warned the people of the riot in Springfield, Ohio, and it came. I warned them of the flood in Columbus and Dayton, Ohio, and it came; and of the disaster in Xenia, Ohio, and many other places and it came to pass. The flood was in Columbus and Dayton, March, 1913. I warned them of the war and of the disease that came all on the account of sin. see visions," and these are the last days that we now live in. I am the last one living in my family and the Lord preserved me for His glory; to lift up Jesus in the beauty of Holiness. I am in the world but not of the world. The Lord has made me a light of the world. Mark the perfect man and behold the upright, for the end of that man is peace. Follow peace with all men and without Holiness which no man shall see the Lord. Nothing in my hand I bring, simply to the Cross I cling, the cross of Jesus. The Lord is my shepherd, I shall not want. He restoreth my soul. He leadeth me in the paths of righteousness for His name sake; thou preparest a table before me in the presence of mine enemies. He anointest my head with oil. My cup runneth over. This is the testimony of James W. Holley, the evangelistic preacher. This is his life. He paid the price. I have never been led of God to preach after night only on the following occasions, three times in all. While at Dayton in 1913 the spirit of the Lord came upon me, and I was commanded to go forth and proclaim a warning of the impending flood. So, contrary to my custom, I forsook my lodging and comforts of a warm bed and all night long declared the council and warning of God of the evil to come, and yet many believed not, tho no man dared touch me, and thus because of unbelief many were destroyed. For I had cried aloud unto them before the dawning of the day, "Can't you watch with me one hour, while I pray," yet many were taken unaware. one particular instance. I was traveling and preaching as I went, and in my journey came to a very desolate country. There was no man or habitation visible and all the land was desolate. All day long I walked and communed with God, and the spirit of God came upon me and there appeared unto me as tho there was one lying dead at my feet; and upon perceiving these things I cried, Oh Lord, I am alone and in a desolate place. Oh let me not be destroyed. And my soul became overjoyed in the Lord, and as I journeyed on rejoicing, suddenly there appeared as tho from a cave men with drawn guns and there were some both before and behind me, but in the spirit I knew no fear and as I shouted in Christ, I passed thru them unharmed and unmolested, for great fear fell upon them. I preached my way thus from Mulleger's Hill to Cammelville, Kentucky, and arriving in the lateness of the night I was received by much people, and the Judge said, "People, haven't you any where for this man to stay? If you haven't, I have, for he is a man of God, for if he hadn't been he could not have come through that place." And the people received me and I preached in that place one week. Many were saved and many hearts were touched. Many people came to church that hadn't been to church for years. If you want wisdom, get it from God, for He said seek and you shall find, ask and it shall be given thee. First seek ye the kingdom of God and His righteousness, and all things shall be added unto you, whatsoever you need. The wages of sin is death, but the gift of God is eternal life through Jesus Christ our Lord:" for he said, Let every soul be subject unto the higher powers, for there is no power but of God. You will find this in Rom. 13:1. 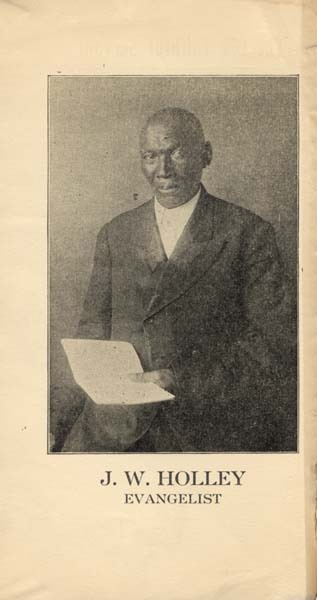 I preached in Winchester, Ky., to five hundred people one night to both white and colored, so they said, and had it published in the newspaper, and they said, "Did you ever hear a man speak like that man?" It wasn't me but God speaking through me, and I prayed in many a home there in both white and colored. I run a revival in Maxville, Ky., in a Methodist church, and they said they hadn't had such a revival as that in ten years and they published it in the paper. There were many souls saved and many reclaimed and I prayed in many homes there, both white and colored. I am nothing but an humble servant of God. Let Jesus lead all the way. Once in my travels I baptized a man twice in the river. He was an old soldier. He is now passed away and he died shouting. Once in my travels through Washington, Ky., I preached to one thousand white people. I will tell you the cause of that: Mr. Walter Bird killed his wife and then shot and killed himself and the white people that I stayed with asked me to go to the graveyard with them, and so they asked if there was any preacher there that could preach the funeral and they said there was but one, and he was colored. So they asked me, and there was no fear came upon me, so I preached the funeral, and it was a sad one. I sang "Hark From the Tomb the Doleful Sound," and gave it out as I sang. People broke down and wept and I never had a day like that since that night I preached to a crowded church of white people. They couldn't all get into the church. It is good to be anchored in the Lord, steadfast and unmoveable. Keep your hands in God's hand and God's hand in yours, for he said, No man can pluck you out of my hands; follow me and I will make you fishermen of men. Since I have been a follower of Him for thirty years I asked Him for to give me a fast day and he gave me Thursday. Some way or other the Lord will provide. I will bless everything you put your hands to and will let it prosper if you walk upright before me. Once when I was a slave, when they had me refugeeing when they were running us off from the Yankees, one night they had us in a deep hollow; way in the night I woke up and I was sweating. I threw the cover off of me and found I was covered with snow. I am the last one living of the slaves that I know anything about. The Lord is keeping me here to preach the Gospel, praise His name, and I thank Him for it. "The half has never been told," I will never be able to tell it all. he is blessed to even come in our homes and pray in our homes. allow kin folks or anybody else to meddle with His business." After God had stripped me away from my brother several years I was in College Hill. It was revealed to me that my brother was dead and I said to Mrs. Fitsjearl, "I am going to write to my brother today, but he is dead." And she said, "Don't say that." I said, "Yes, he is dead." So she said, "I will write the letter for you and see if you do know." So she wrote the letter; in two or three days the answer came back that my brother was dead and had been dead for two years, and by hearing from him I heard from my uncle, of whom I had not heard from since I was a boy. He died two years before my brother. It was my brother's wife that answered the letter. She said they hunted everywhere, but could not find me. When I was in Springfield warning them of the riot a horse bowed on his knees while I was on my knees praying in front of a bar room. A man ran out of the bar room and kicked and tried to make him get up, but the horse would not get up until I had finished praying. It was on Saturday, a market day. There are many witnesses living today that saw this sight. Elder Lankford and brother Honninger and many other living witnesses living today that saw it. Both of the preachers got scared. The Lord was even speaking through the horse of the disaster, but for all that they wouldn't believe, they were such unbelievers. Now you can see how the Lord uses me and some of the things I have went through; even my mother was whipped to death in slavery. I was but two or three days old, so my grandmother said, but even at that God has taken all enmity out of my heart. I love everybody. I'm asking God to pour out a double portion of his spirit upon me each day. I live. I want my last days to be my best days, for I am living for that end. I am writing the things that the Lord is revealing that I should write of the history of my life; he is bringing my remembrance to me by the Holy Ghost. I have preached for five winters in Columbus, through snow and ice, rain and sleet, and slush covered the ground, always was I to be busy in the cause of the Master. I went to California in September, 1920, and saw many works of God's great creation, and they are wonderful. I have crossed the Great Salt Lake in Utah and brought back a bag salt. I crossed the water in Oakland, Cal., on the largest boat in the world. I boarded a train and crossed the water by rail, and it took two hours to cross by the watch. I brought many scenic postcards back for souvenirs. I have traveled over 4,000 miles in the year 1920.
over the Depot and see something. I did not want to go, but they said, we want you to go and see a sight, for you are an elder and travel, and you can tell the people some of the things that are going on in the world. I saw many people there without homes or clothes or food, and no money, and I broke down and wept. There were people of all nationalities, and a pitiful sight, and he said half of the people don't know what the other half are doing, except they travel about. Now Jesus came to John to be baptized, and John did not want to baptize him. Jesus said, suffer it be so now, for it becomes us to fulfill all righteousness. And he suffered it to be so and went down into the river Jordan. He came straight way out of the water, and the Spirit in form of a Dove lighting upon his shoulder, and the voice of God came saying: "This is my beloved Son in whom I am well pleased. Hear ye him." So many say they are following Jesus, but they are not following Jesus, for if they were following Jesus they must do the things Jesus did. Like manner before I could preach the Gospel I had to do the things that Jesus did. He gave me the knowledge to do these things, for I can neither read or write. I was not baptized into the river Jordan, but I was baptized into running water. You will find this in St. Mark 1:9 to 11 verse. He is a true prophet anointed by God. I was born with a gift from God of Divine healing, every one that I pray for, that has faith, is healed without a drop of medicine. It's a gift of God, and you cannot sell or purchase the gift with money; if you do, you will perish according to the Scripture. You read in the 5th chapter of James 14th verse, If any are sick among you, let him call for the Elders, let them pray over him, anoint him with oil in the name of the Lord; and the prayers of faith shall save the sick, and the Lord shall raise him up. That was laid down from the foundation of the world, and you can't get around it. The Scripture must be fulfilled. I am a man of God, been tested and tried.